How to use Lucky Mojo sachet powders and natural mineral dusts for sprinkling, blowing, and dressing papers. The King Solomon powder is what really sold me on LM made products vs doing it all myself from scratch. 2 years ago my son was incarcerated for "Getting in touch with my gypsy roots," his phrase. He was a meth-head street thief who wasn't allowed in my house to be blunt. He spent over a year in State custody. Up until then I had been using my old family recipes, alone, to work on him. Mostly stay-safe and protection work, with St Dymphnia and St Jude thrown in. One day, last year I ran into an occult store that sells Lucky Mojo products and got to talking with the owner about the herbs I was purchasing (he's a rootworker too). My son was out on parole, but still making the same mistakes all over again. He suggested that I add something to encourage common sense or maturity to my workings. I said I would research it, ask relatives, and try on the next moon. He reached behind himself and picked up a half full packet of Lucky Mojo King Solomon sachet powder - and said "On the house, I know you'll see results with this." Wow! The kid has a professional chef's job, has completed almost everything required for parole (just time remaining), goes to church a couple of time a month, and is thinking about community college. Can I blend and mix everything from scratch? - sure, most of us here can. Do I have all the rare and exotic curios to heighten the work? - mostly. Yeah, I can do it solo - but why should I when cat and the whole of the Lucky Mojo family are there to back me up. That's my testimonial for Lucky Mojo. I've been reading here for several years, been buying Lucky Mojo products from an authorized reseller, now I'm interested in taking the class so I'm working on becoming a known customer. 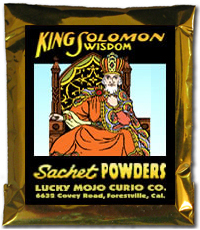 King Solomon Wisdom Sachet Powders can be used to dress papers, photos, carpeting, or one's body. Yes, this is the correct product! And CONGRATS on your new baby!!!!!!!!!!!!!!!!!!!! !